When looking for a printer for your business it is important that it is as easy to use as it is powerful. 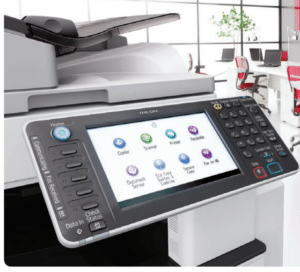 The Ricoh Aficio C5502 is the perfect solution for businesses that want a streamlined process with high quality results. This multipurpose copier and printer can tackle the biggest of jobs with consistently brilliant results. The Ricoh Afico C5502 has color copier, and print capabilities alongside a powerful scanner that features an easy to use touchscreen interface that simplifies the toughest jobs. It will be easy to get the high quality color prints you need when you need them. The Ricoh Aficio C5502 features a warm up time of less than 24 seconds, and a color print speed of up to 55 prints per minute. That means that you can get your toughest print and copier jobs done faster than ever, so you can spend more time working and less time waiting for your printer. You can also save time by sending print jobs wirelessly from most mobile devises. Simply download the app and you can send print jobs from almost anywhere. The Ricoh Aficio 5502 also has a USB port and SD card slot for convenient access to files in any format. There is also the option to add security to your copier. With an optional data Overwrite Security System your hard drive will be safe from anyone trying to get in. Many people worry about network security and never consider the sensitive information stored in copiers’ hard drives. Luckily, with the Ricoh Aficio 5502, you can ease your find from this potential security risk. If you think that the Ricoh Aficio 5502 sounds like the perfect addition to your office then don’t hesitate to give us a call. At Albuquerque Copier we will answer and questions you may have, and we will set you up with the best copier lease in Albuquerque.